As climate change continues to accelerate, causing extreme weather from devastating droughts to extreme floods, communities are seeking innovative ways to develop community based resiliency to climate change. HighWaterLine brings together community members and experts from diverse disciplines to devise climate change resiliency at the local level. We do this via workshops and public art activities that facilitate knowledge sharing amongst community members while also introducing new skills and facilitating new community collaborations. Storytelling: We bring together participants from diverse backgrounds and disciplines to share and hone their personal stories about why they do what they do. This forges community connectivity at the personal rather than the institutional level. Sharing personal stories establishes a solid base for developing genuine community collaborations. Oral History: We share best practices in collecting individual and neighborhood stories of place and visions for solutions. Where possible we engage local historians in assisting the community in building an archive of local knowledge on climate change as well as local ideas for building resiliency. Translating Scientific Data into Information that Resonates with the Community: We guide participants in using scientific data to develop their local HighWaterLine route. This workshop also includes identifying places of community, historic and cultural importance as well vital community infrastructure that will be impacted by climate change. Creative Brainstorming: Artists are wonderful at inspiring people to expand the solutions they devise. 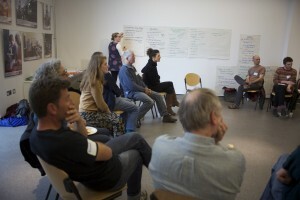 We facilitate workshops in which community members and experts participate in solution focused workshops facilitated by local artists to help people expand the possible approaches for tackling climate change. Humans are a visual species and learn information more easily via visuals than text. The HighWaterLine art project uses bold visuals to publicly demarcate what will be flooded or underwater due to accelerated climate change. 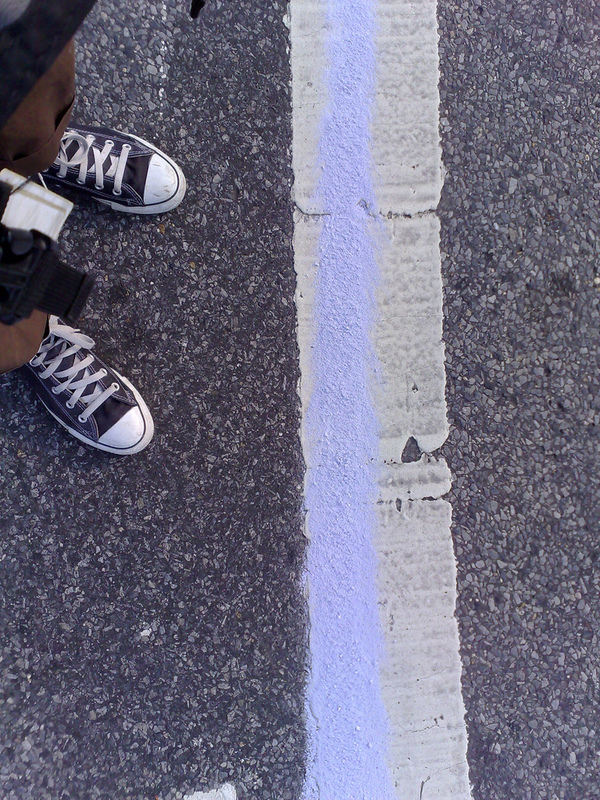 When Eve first realized the project she used a sports field marker that allowed her to create a thick blue line of chalk demarcating 70 miles of flood zone. 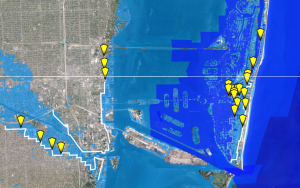 Communities realizing the HighWaterLine are invited to use whatever visual medium they feel best allows them to illustrate the flood or sea level rise impacts in their respective communities. We collaborate with communities to brainstorm on the best visual medium for their neighborhoods. Another key element of the art component is to create opportunities for learning via curiousity (how humans learn best). 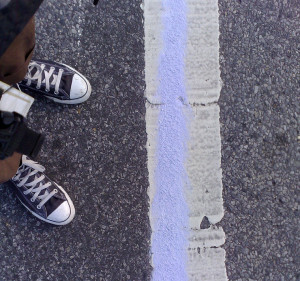 This translates into those demarcating the line deliberately moving slowly doing an unusual activity in their neighborhood which inspires neighbors and strangers to approach them to ask what they’re doing and engage in conversations. The workshops held prior to the actual demarcating of the line allow for participants to create an art piece based on a route they feel best illuminates the places of importance to them as well as learn about and ultimately share resiliency solutions with the people who approach them as they realize the art piece. Beyond the marking of the line, communities can use the momentum generated by the project to create additional public interventions highlighting climate change threats or solutions. We gladly provide support and guidance to communities who wish to realize subsequent creative solutions. With every iteration we seek to leave a greater community legacy. This includes participants attaining greater knowledge of regional climate change issues and solutions, learning new skills, participating in new community collaborations and more. 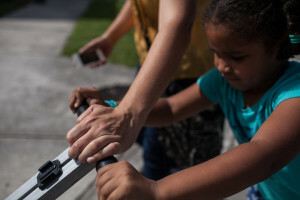 We also connect participating HighWaterLine communities to each other so that communities can support each other by sharing best practices for developing resiliency at the community level, how to overcome challenges in realizing these solutions and more.